Madame (as the first grandchild on my side of the family and all-around special baby that she is) got lots of stuff for Christmas, some of which we wisely held back for a later date. She doesn't know the difference now, and eventually it's the parents who get sick of a particular toy, not the baby. 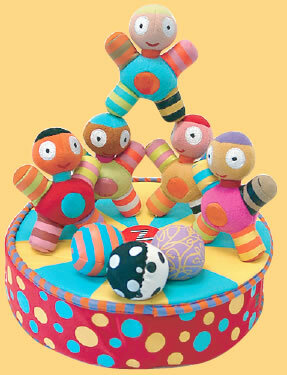 So recently we rotated into the collection a really cool toy that my aunt got her - Kushies Zolo Stacrobats. I can't really figure out what exactly Zolo is - I think it's some sort of toy brand created by a design group - but they make toys for older kids and also have a "Kushies" line of toys for babies. The Stacrobats are these little, magnetic, semi-plush figures and come in a carrying case/stage for the baby to stack them on to. They are colorful, easy to grasp and are honestly the one toy she plays with that I am interested in playing with it, with her. I can't speak for the rest of the Zolo toys, but if they're anything like this one they must be good.